Everyone’s favourite accordion-playing musical parody master Weird Al has long been an unequivocal staple of modern pop culture. The musician and satirist’s illustrious four-decade-long career is still going strong, especially after the recent August 27 accolade of a star on the Hollywood Walk of Fame. With this star, awarded in the category of recording, he joins the ranks of over 2,600 actors, musicians, producers, and other entertainers honoured with their names engraved on Hollywood Boulevard. Alfred Matthew “Weird Al” Yankovic began recording and releasing comedic songs in 1976. Since then his resumé has included 14 studio albums, 10 compilation albums, 54 music videos, and over 150 comedic songs full of clever parodies and ingenious genre mash-ups, backed by a persona that’s quirkily, admirably wholesome. Prolific and long-spanning as his career has been, no doubt everyone has their own favourite Weird Al songs. Nonetheless, let’s take this opportunity to recognize a few of his more clever, memorable, and iconic compositions. 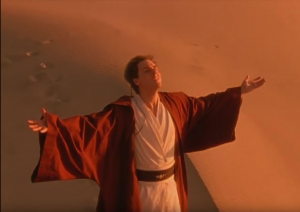 I’ve heard people remark that this masterpiece is the only reason they know the original song, Don McLean’s 1971 classic “American Pie,” and the only reason they know anything about the first Star Wars prequel movie. This pop-culture-didacticism is a common theme in a lot of Weird Al songs and part of the reason he’s such a legend. Beyond that, every line of this parody—starting with from the introductory “A long, long time ago/In a galaxy far away” is poignantly descriptive and hilarious. The music video, with Weird Al as Obi-Wan, probably features better acting than The Phantom Menace anyway. This spoof of Queen’s “Another One Bites the Dust” is the Metro Vancouver transit-user’s must-have. The driving pace and iconic riff of the original transposes very fittingly into the impassioned, accordion-backed Weird Al version, which describes an uncomfortable, all too familiar experience of being stuck on an increasingly-packed bus. It’s gloriously painful for its relatability. I admit I personally am predisposed to love and hate this song because it parodies virtually my exact musical taste (I unironically thrive on Disturbed’s “Down with the Sickness” and System of a Down’s “Chop Suey”). Yet we can’t omit acknowledging the genius of Weird Al’s signature medleys, which are comprised of polka-style song covers. Again, they’re surprisingly effective at exposing listeners to some huge hits and perhaps letting you enjoy those hits a little more shamelessly.